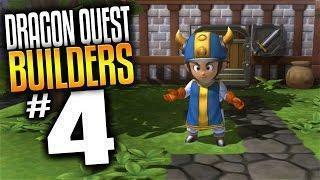 Welcome to my Dragon Quest Builders Gameplay Demo – Ep 4 – Invasion Defence or simply Let’s Play Dragon Quest Builders! It’s like Dragon Quest Minecraft! I’m going to be going through the demo of the game to get a feel for what to expect and share the experience I have with you guys as I play Dragon Quest Builders for the first time. The game takes place in the land of Alefgard where people have forgotten how to build and it’s my job to teach them and rebuild the kingdom! ■Build a variety of unique tools from materials you gather, and rebuild towns and cities to restore life to the shattered world of Alefgard. ■An intuitive control system will have you building the towers and castles of your dreams in no time. ■Play your own way—an immersive DRAGON QUEST® story and world to explore, combined with the freedom of sandbox gameplay, provides a new and exciting, family-friendly experience. ■Battle with famous monsters from the DRAGON QUEST series and interact with gorgeously designed 3D characters. Media speculation from when the game was first announced was that Dragon Quest Builders would be a Dragon Quest version of Minecraft. Early screenshots show the player building a camp out of blocks; the camp gains levels based on how much it has been built up. Monsters such as Slime and Dragon from the original Dragon Quest appear in the game. The player has a health bar, and must eat food over time, similar to Minecraft. The game is set in Alefgard, the world of the original Dragon Quest. The game is based on a parallel ending of Dragon Quest: before the final battle, the hero accepted the evil Dragonlord’s suggestion – each rules a half of the world. But that’s indeed a trap, and the hero was eliminated, then the world was dominated by monsters. With time passing by, a new hero (the player character) appears to revive the desolate world. Players gather “material” all over the world in order to rebuild the land of Alefgard from scratch.